You may have had a professional service design and install your data center which is now up and running. However, you would be wise to continue to utilize their certified personnel to oversee your data center maintenance. Utilizing ongoing data center maintenance plans limit the downtime your company may experience due to outages. Regular maintenance will also allow you to enjoy continuous availability. 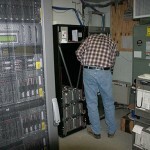 Preventative data center maintenance focuses on early detection of component or system problems. It also involves the replacement of various components that may be performing questionably before they have a chance to wreak havoc. All of the equipment in your data center can benefit from preventative maintenance, including your UPS, computer room air conditioning, and generators. Power outages are not only frustrating, they can also be extremely expensive. The halt of productivity and business transactions during a power outage can have far-reaching effects, the consequences of which can last for quite some time. An uninterruptible power supply (UPS) system is designed to protect your data center function in the event of such outages. Regular UPS maintenance ensures proper functioning at optimal levels. This, in turn, ensures your UPS will be ready and waiting when called upon. Computer room air conditioning (CRAC) is essential to proper data center function. Managing a cooling system falls outside of typical IT areas of expertise. This is an excellent example of where professional data center maintenance is a boon. These certified professionals are adept at both IT and CRAC management and maintenance. As components continue to get smaller and more efficient, their cooling needs become even more critical. Data center professionals can design and install a cooling system that will keep your data center at appropriate temperatures for optimal component functioning. Their maintenance programs will ensure that this cooling system continues to work properly and that components are not overheating. A generator is another piece of equipment in a data center that needs maintenance care to ensure proper function. While battery backup exists to ensure continued data center function for a few minutes in the event of an surge or outage, generators can pick up from that point and keep your data center running much longer. A unique aspect of your generator is that it does not run continuously. This makes it harder to monitor if it is in working order, ready to jump into action when called upon. With a data center maintenance plan, your generator will be routinely inspected to insure it is always ready and able to do just that. Proper data center maintenance not only ensures proper data center function, it also significantly increases the life expectancy of critical equipment. Extending the life of this equipment saves you money and reduces the need to switch out old components for new ones. Such switches can cause temporary business interruption. Consequently, minimizing the incidence of switches is highly preferable. There are many benefits to having a preventative maintenance plan for your data center. You will improve reliability, increase efficiency, and decrease both replacement costs and downtime. Whether you data center is large or small, regularly scheduled examinations of your equipment, cooling system, and site conditions will not only support continuous facility function, but minimize emergency service visits as well. This entry was posted in data center maintenance and tagged data center maintenance, data center maintenance plans, data center repair. Bookmark the permalink.